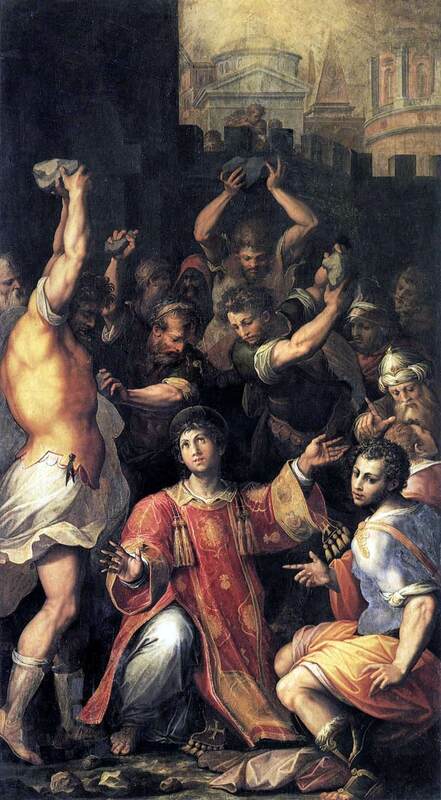 The body of St. Stephen, the first martyr, with those of some other saints, was discovered near Jerusalem in the year 415. Later the body of the saint was taken to Constantinople and finally to Rome, where it now lies beside that of St. Lawrence. The many miracles that occurred on the finding of St. Stephen’s body led to the institution of this festival, besides that of December 26th. A tradition states that Gamaliel, the teacher of St. Paul, had buried the body of St. Stephen at his country house; Nicodemus and Abibas, son of Gamaliel, and Gamaliel himself, were also buried there. Grant us, we beseech Thee, O Lord, to imitate what we worship, that we may learn to love our enemies also; for we celebrate the finding of him who knew how to pray even for his persecutors to Our Lord Jesus Christ, Thy Son. Who with Thee livest and reignest, in the unity of the Holy Ghost, God, Forever and ever. Lesson from the Acts of the Apostles. In those days, Stephen,, full of grace and fortitude, did great wonders and signs among the people. Now there arose some of that which is called the synagogue of the Libertines, and of the Cyrenians, and of the Alexandrians, and of them that were of Cilicia and Asia, disputing with Stephen. And they were not able to resist the wisdom and spirit that spoke. Now hearing these things they were cut to the heart, and they gnashed with their teeth at him. But he being full of the Holy Ghost, looking up steadfastly to Heaven, saw the glory of God, and Jesus standing on the right hand of God. And he said, Behold I see the heavens opened, and the Son of man standing on the right hand of God. And they crying out with a loud voice, stopped their ears, and with one accord ran violently upon him. And casting him forth without the city, they stoned him; and the witnesses laid down their garments at the feet of a young man whose name was Saul, And they stoned Stephen, invoking and saying; Lord Jesus, receive my spirit. And falling on his knees, he cried with a loud voice, saying: Lord, lay not this sin to their charge. And when he had said this, he fell asleep in the Lord. Princes sat, and spoke against me; and the wicked persecuted me. V.Help me, O Lord, my God: save me for Thy mercy’s sake. Alleluia, Alleluia.V. (Acts 7: 56) I see the heavens opened, and Jesus standing at the right hand of the power of God. Alleluia. The apostles chose Stephen, a levite, full of faith and of the Holy Ghost, whom the Jews stoned, praying and saying: Lord Jesus, receive my spirit. Alleluia. Receive our gifts, O Lord, for the commemoration of Thy saints, that, as suffering hath made them glorious, so devotion may render us blameless. Through our Lord Jesus Christ Thy Son our Lord, Who liveth and reigneth with Thee in the unity of the Holy Ghost, one God Forever and ever. May the mysteries we have received aid us, O Lord; and by the intercession of blessed Stephen, Thy martyr, may they confirm us in Thine everlasting protection. Through the Lord Jesus Christ, Thy Son, Who liveth and reigneth with Thee in the unity of the Holy Ghost, one God For ever and ever.